Recently at Comic Con we came across a new comic book company, Contraband Comics. Among the titles (or rather covers!) 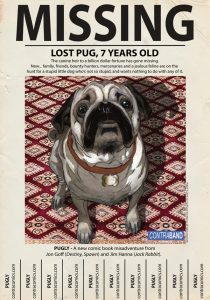 that caught our eyes was a new full-color one called Pugly, “A new comic book misadventure from writer Jon Goff (Destiny, Spawn) and artist Jim Hanna (Jack Rabbit)”. Meet Frank, a pug-dog whose only goal is to enjoy life in his huge palatial home with his loving elder mistress, Mother. Unfortunately that’s complicated when she passes away — and it only gets more complicated when she wills her entire vast fortune to him! As he explains, that’s just the beginning of Frank’s adventures in a much larger world. Take a look over at Contraband’s web site to learn more about him.